Gt Yarmouth Quay mill was an open trestle postmill that stood on a large mound on the east bank of the River Yare. 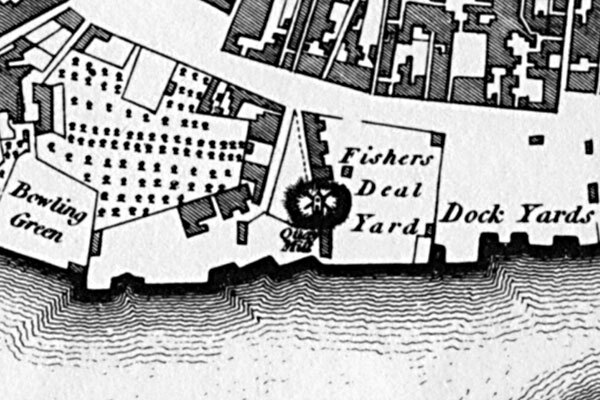 One of the first erections on the North Quay was a post windmill, which in 1579 one Christopher Short was allowed to build on 'a plot of ground' there. THE WIND-MILL known by the Name of Quay Mill in Great Yarmouth together with all the Materials. Enquire of Mrs. Ann Dobson or of Mr. Ramey of Yarmouth. A Good and well accustomed WINDMILL situated on the Key in Yarmouth and commonly known by the Name of the Key Mill. The Whole is in very good Repair and may be viewed any Time before the Sale. On Wednesday the 9th Day of February Inst. by Order of the Assignees under a Commission of Bankrupt lately awarded against Mr. Christopher Eaton. All the real ESTATE of the said Mr. Eaton situate in Yarmouth, viz. Lot IV. A Corn Windmill in good repair situate on the Key and commonly called the KEY Mill. Further Particulars may be had of Mr. William Palgrave, jun. one of the Assignees or of Mr. Spurgeon in Yarmouth. Creditors of Christopher Eaton of Great Yarmouth, a Bankrupt . . . to meet on Monday 25th this Instant April . . . PREMISES near the Quay Mill . . . Dwelling house . . . for a CURRIER & LEATHER SELLER . . .
ROW No. 34 from North Quay to George Street, called Quay Mill Row, because a post windmill, named the \Quay Mill formerly stood opposite to it upon the ground adjoining the river. This mill, which is depicted in Corbridge's map, with the mill house, granaries and other outbuildings belonging to it remained standing until 1799, when the property was conveyed by Robert Pettit and others to William Palgrave, Esq., who sold it to Mr. Howes, by whom the mill was taken down and a dwelling house erected, which in 1810 was purchased by the late Edmund Preston, Esq., who greatly enlarged the house, which he called MILMOUNT and laid out the grounds as a garden extending to the river. MILMOUNT HOUSE now occupied by Samuel Nightingale Esq., . . . was purchased by Sir Edmund Lacon & Sons, who erected a large brewery store upon the site of the garden capable of holding about 3000 barrels. Adjoining the millyard there was in the 18th century, a large timber and shipbuilders yard belonging to Thomas Horsley. 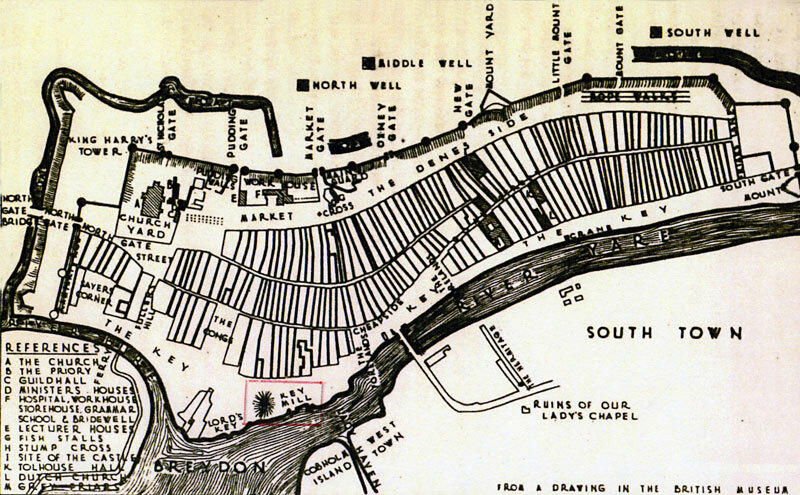 Plan of Yarmouth about 1619. 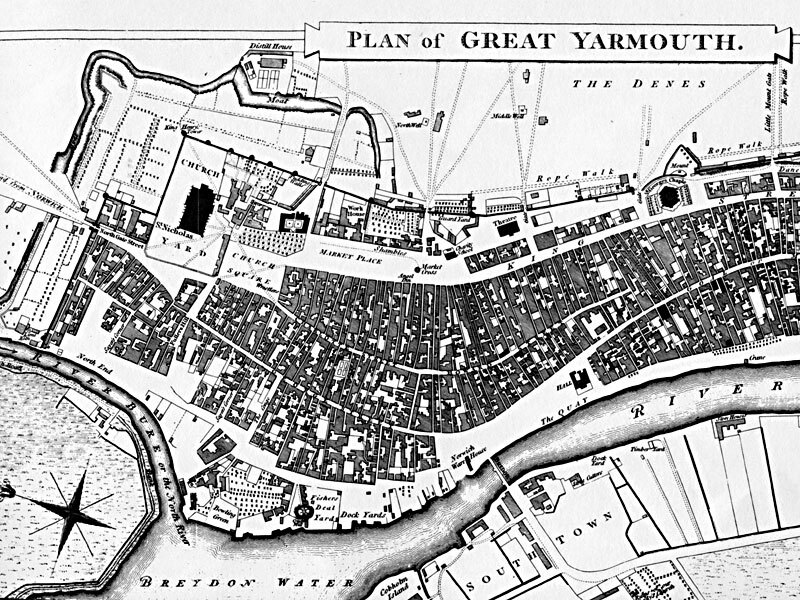 The picture-map chosen to illustrate the medieval layout of Yarmouth is that published by Sir Robert Paston in 1668 to promote an ambitious but abortive scheme to develop his marshes at Little Yarmouth or Southtown on the opposite bank of the River Yare. It shares with Sir Bernard de Gomme's manuscript map of 1668 the distinction of being the earliest reasonably accurate survey of the town . . . The map is reproduced from an original in the Norfolk & Norwich Archaeological Society Library . 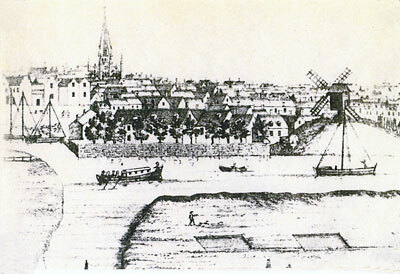 . .
"View of Yarmouth as it appeared in 1775"